Allow water vapour to exit your roof-space. Enable air to circulate, discouraging the formation of mould and rot.and damaging your timbers. Some (not all) remove the need for expensive / ugly air vents. Reduce heat loss, saving you money and lower carbon emissions. 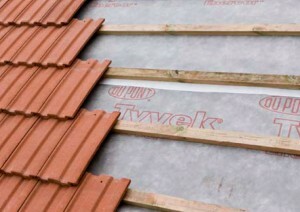 Minimise the likelihood of slates and tiles being blown of your roof (by reducing the impact of wind lift). Act as a barrier to insects, dust and airborne particles. Tyvek® membranes for pitched roof constructions provide excellent protection against external weather conditions whilst allowing water vapour to freely move out of the construction. With the new Tyvek® Enercor® membrane combined with some minor changes in installation practices, an important reduction of radiant heat losses can be achieved. Tyvek® Enercor® Roof is a vapour open roof underlay with a metallised surface which keeps radiant heat out in summer and helps to reduce heat loss in winter. Tyvek® Enercor® Roof should be used in unsupported (tiled/slated) roofs and fits also for profiled cladding (metal sheet) pitched roofs. Tyvek® Enercor® membranes in combination with the VCL DuPont™ AirGuard® Reflective and some minor installation specialities offer significantly energy savings of up to 15%. 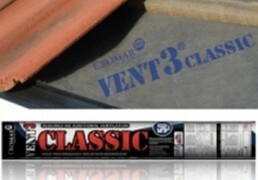 This underlay is a vapour open drainage membrane with integral adhesive lap allowing eventual condensation beneath Stainless Steel, Copper and Zinc roofs to drain away. It is designed for use beneath standing seam metal sheet roofs over timber boarding and even more important over softwood boarding.